The bow drill was also used in woodworking and furniture making, but it made only one hole at a time. Ostrich eggshell, after scoring; it was easy to snap off a suitable piece for bead making. Holding the fixing stone between my feet, drilling begins. Water was used to lubricate the drill. Drill before and after drilling--the soft egg shell caused little wear. 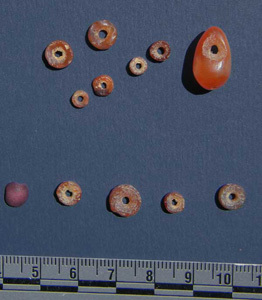 Carnelian beads from Tomb 18 in the elite cemetery at HK6 dating to the mid-Predynastic come in a variety of shapes and sizes. Carnelian from the cache close up; all had been tested for color and quality. After shaping with a hammer, the bead blanks were ready for polishing and drilling. Drilling the carnelian worked about as well as the polishing, which means not at all! The bead blank after all the drilling attempts shows only a few scratches. The microdrill was the only thing that changed during the drilling process; the tip was worn down to a nub. All photos courtesy of the Hierakonpolis Expedition unless otherwise noted. Click on images for larger versions. 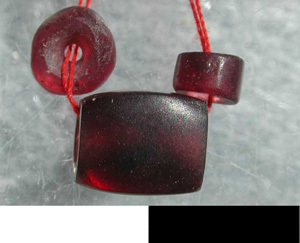 Beads from Tomb 11 in the elite cemetery HK6 (Dynasty 0). 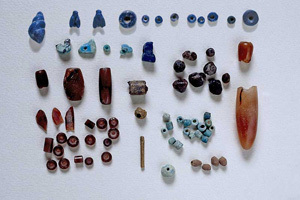 This tomb of an adolescent boy had the highest number and more diverse collection of beads found to date at Hierakonpolis. Materials include: turquoise, carnelian, gold, faience, clay and lapis lazuli some carved into the shape of flies and seashells. 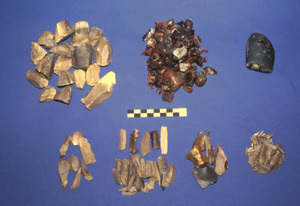 Garnet pebbles or possible bead blanks were also found (middle right). (Peter Hayman) Beads from cemetery HK43 Burial 165. Very few beads were found in the "worker" cemetery in general, and only in two graves were beads found in situ, both those of children. The beads from around the neck of the child in Burial 165 were the finest and hardest. The sequence replicates the ancient pattern, although the original string had long ago disintegrated. A microdrill close up; tiny flint perforators apparently for bead making. The desire for personal adornment, especially in the form of beads, has been with us for a very long time-- as far back as the Neanderthal era, some 75,000 years ago or perhaps even more (see "More than an Ornament". Like many before them, the Predynastic (ca. 3600 B.C.) inhabitants of Hierakonpolis gave into this primeval urge, but seemingly not as freely as those living at other sites of this time. Beads are not especially prevalent, except in the graves of the elite where the selection is choice, but limited in quantity. Then as now, beads were valuable and this lack probably has more to do with theft and plunder over the millennia than with any disaffection for such finery. 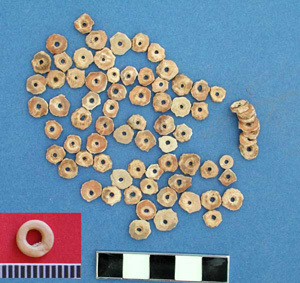 In fact, bead making appears to have been a significant industry at Hierakonpolis--far more plentiful than the beads themselves are the tools used to make them...or at least this is what we think they are. 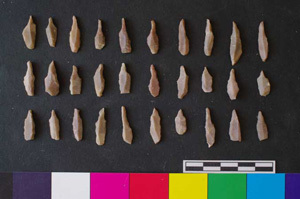 Distinctive little flint borers, called microdrills, averaging only 2 cm in length, have been recovered in great numbers at Hierakonpolis in conjunction with evidence to deduce their use. In 1899, the British archaeologist, F.W. Green, discovered two caches which he described as containing "an enormous number of exceedingly small pointed flint implements" (i.e., microdrills) along with many broken carnelian pebbles, some chipped into the form of rough beads, some showing the signs of the beginning of the boring operation, as well as chips of amethyst, steatite, rock crystal, obsidian and ostrich egg shell. These objects had been stowed in cavities, rather like little lockers, hollowed out at the base of the outer wall surrounding the temple precinct in which the famous Narmer palette had been found just the year before. Green attributed them to the Old Kingdom, but they may be older (J.E. Quibell and F. W. Green, Hierakonpolis II, 1902: 11-12). 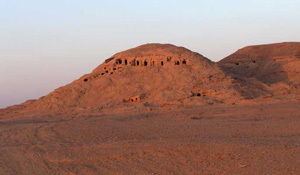 The tombs of the New Kingdom, cut into the round-topped knoll called the Burg el Hammam (Pigeon Hill), served as the residence of the British archaeologists working at Hierakonpolis in 1898-1899. 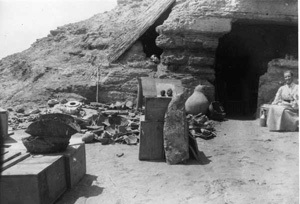 The copious finds made at Hierakonpolis in 1898 are ready for packing in front of the New Kingdom tomb of Hormose. 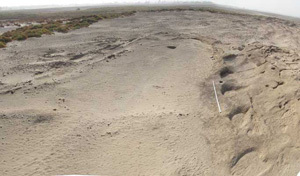 What couldn't fit in was buried on the spot, the disturbed soil in the foreground is the approximate place where the bead-making cache was rediscovered in 1996. The British excavations revealed not only tiny flints but also some of gigantic size--the giant flint knife propped up against the crates is 2.5 feet long! (Courtesy of the Petrie Museum, archival neg. PS 327383). Selected items from one cache were taken back to England and now reside in the Petrie Museum of Archaeology at University College London and include 464 microdrills, and several unfinished beads (see the online photo and description of UC 14877. The whereabouts of the second cache remained a mystery until 1996, when we rediscovered it carefully re-cached in a small pit in the ground just outside of the New Kingdom rock cut tomb that the British team in 1898-99 called home. Apparently with so many wonderful finds, some things had to be left behind and when the packing crates were full, the residue was buried on the spot. Whether this cache and the other abandoned objects were originally meant to be retrieved later is unknown, but it took almost 100 years before they finally were. This cache not only contained a large number of microdrills, but also the cores and numerous blades from which they were made, a substantial quantity of broken carnelian pebbles, and even a handy little hammer stone. The complete kit...or so it seemed. More of these little drills were found in 1985-86 during excavations at the ceremonial center at HK29A (see web updates for 2002-2003), where they were the most prevalent tool at the site and were especially numerous in the deposits covering the east half of the oval floor. During preliminary analysis of less than half of the assemblage 553 of them were counted, making up 35% of all identifiable tools recovered. Their presence at this site suggests that workshops with craftsmen specializing in the creation of various high status items were attached to the sacred precinct, functioning like the temple workshops known later in Egypt to supply the gods and their representatives. 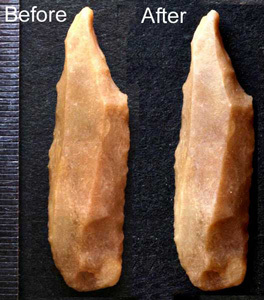 As we are currently involved in the detailed analysis of the lithic material from the ceremonial center, we naturally became interested in how these tools actually worked. Despite the evidence of the associated raw materials, few are willing to commit on the function of the microdrill. Green would only say that they were evidently for boring beads of carnelian and the like, but just how this was accomplished was not evident. The ceremonial center at HK29A. Microdrills were especially numerous in the deposits over the floor of the oval courtyard. 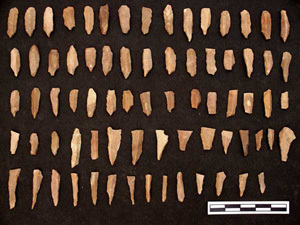 A small selection of microdrills from the ceremonial center at HK29A. 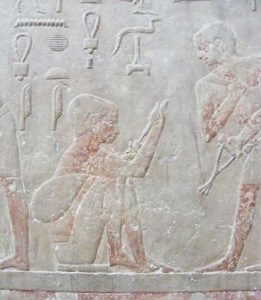 More recently, Denys Stocks, in his fascinating study of ancient Egyptian stone-working technology (Experiments in Egyptian Archaeology 2003), was equally cautious and queried the true function of microdrills pending microscopic examination for wear patterns. 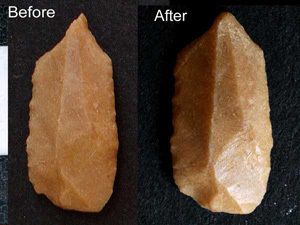 While not really questioning the efficacy of flint, Stocks has instead been investigating bead-making via experimental reproductions of ancient Egyptian bronze tools. 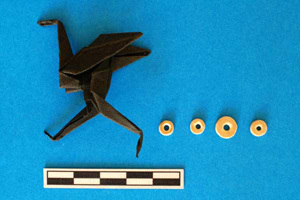 With these, he was able to bore beads made out of a variety of materials using a bow drill. Based on artistic representation he has also been able to reconstruct the clever method developed in the New Kingdom by which multiple beads were produced at one time. It was still an arduous task. Even with a bronze drill bit, for hard stones like quartz and amethyst he calculates that it took up to 300 minutes to drill a hole 1 cm deep. 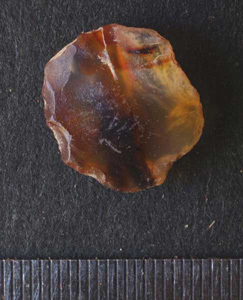 As most carnelian beads at Hierakonpolis are about 3 mm thick, each bead would then have taken about 1.5 hours to perforate using a bronze bit--how long would it have taken with flint? Considering this time investment, it is little wonder that techniques to allow mass production were sought. So how did they make beads in the Predynastic period? What were these little drills really for? We decided to do a few experiments of our own to gain better insight into the problems and possibilities. 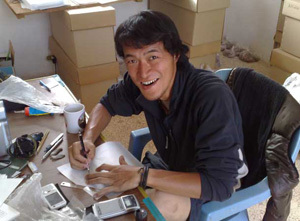 Hitoshi Endo, experimental bead maker, studying lithics at Hierakonpolis. 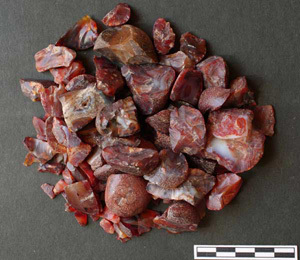 A wide variety of materials were used to make beads in Predynastic Hierakonpolis. Not all of the raw materials were available to us, but using what we could, we decided to begin with the softest materials and work upward to see just what a flint microdrill could do. First to be tested was ostrich egg shell. 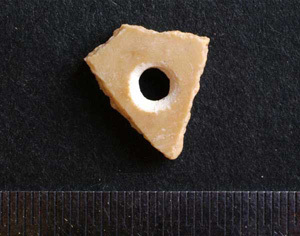 While beads of this material are not especially common in Predynastic Hierakonpolis, they do occur at most localities. 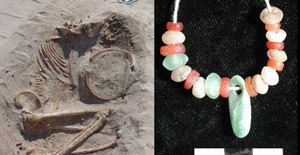 Most appear to be well made, but the largest single collection, found as a necklace around the neck of an infant in Burial 300 of the HK43 non-elite cemetery are rough and clearly unfinished. 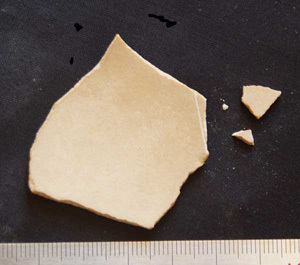 Ostrich eggshell beads from HK43 Burial 300, the burial of an infant have only been roughly shaped and perforated, while those from other parts of the site, although infrequent, are usually well finished (see inset). As with all beads, the first step is to break up the raw material into a workable size and roughly shape it. 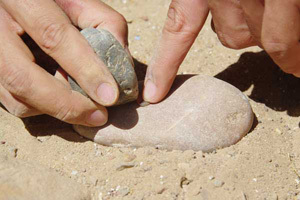 Because the available piece of ostrich egg shell was collected from the surface, it was a bit brittle so I decided only to snap off a small piece rather than create a rough circle with a hammer stone. The bead blank was then set into a piece of local sandstone into which I had carved out a small hollow. With a little bit of mud, this held the blank firmly in place for drilling. Tools of the trade: the microdrill set into its handle and the fixing stone for holding the bead in place for drilling. The seal cutter in the Old Kingdom tomb of Ti at Saqqara. Wrist action appears to be the driving force. In order to use the microdrill, the flint tool was set into the split end of a wooden handle and held in place with string. The wooden handle was about 2 cm in diameter and about 35 cm in length. 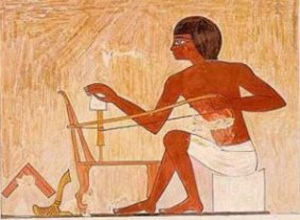 Once completed, it somewhat resembled the tool held by the seal cutter in the Old Kingdom tomb of Ti. Although in that depiction, the artisan is apparently using wrist action to create the rotation, I used a different, perhaps less elegant, method, influence by my experiences in India. 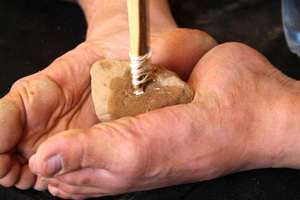 With the bead-fixing stone held between my feet, I rotated the drill handle between my palms; water was added to lubricate. It worked perfectly and I was able to drill one bead in about 3 minutes, first drilling one side and then flipping it over and doing the other. The drill bit showed almost no signs of wear at all. Once successfully perforated, it was time to polish the bead. I polished the bead edge first on a piece of local sandstone with the help of water as lubricant and then gave it a fine finish on a hard sedimentary rock picked up on the desert surface. It took about 15 minutes to make a smooth, circular bead that is almost impossible to distinguish from an ancient one. It was so easy, I made three more. Encouraged by this success, I tried the drill on a number of other materials to test its perforating power. Bone, limestone, and greywacke could be drilled with more or less effort, but without difficulty. When it came to carnelian, however, it was a different story. Carnelian, also known as red chalcedony, sard, or red agate, is a silica mineral and it is hard, rating a 7 on the Mohs Scale of mineral hardness, which is the same hardness as flint. 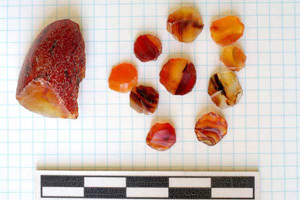 Waterworn pebbles of this translucent red to yellow stone were widely available in ancient times and could be collected on the surface in the Eastern Desert. Many of the pieces in the bead-kit cache still have the weathered cortex on the exterior. The pebbles in the cache are usually about 3-5 cm in diameter and all had been tested for color and quality with a neat knick off one side. The attempt to polish the bead edges on sandstone was unsuccessful--a sign of things to come. Carnelian is easy to fracture, so knocking off a piece to the correct size is not difficult. I then began to shape the piece into a circular form, first roughing it out by knapping the edges on an anvil stone. After that I used only a hammer stone to shape a fairly round bead blank. The hammer and anvil stone were hard sedimentary rock I collected from the desert surface. This part of the operation required no special equipment. The edges of most (but not all) ancient carnelian beads have clearly been ground smooth, so I tried to grind a bead edge using the sandstone that worked so well for the ostrich egg shell. I got nowhere on the carnelian but managed to make deep furrows in the soft sandstone instead. This was a harbinger of things to come. Installing the carnelian blank carefully into its sandstone holder, I tried to bore it with the flint microdrill tool. Rotating it between my palms with the help of water, again I made no impact on the carnelian but managed to wear the tip of the drill down to a nub. We even tried to increase rotation with the use a makeshift bow, but still no luck. As the carnelian is as hard as flint, if this was going to work, some abrasive was going to be needed. I tried the finest quartz sand I could find in the immediate vicinity, but it was still too coarse and simply rolled away. Although a reservoir to hold it in place may have helped, it was clear that regular sand wasn't fine enough for the small perforation required. So how did they do it? Denys Stocks mentions that even with the bronze drill an abrasive was required. Several authors mention the use of emery, which technically is a fine sand made from a very hard form of aluminum oxide (corundum) which has a Mohs scale hardness of 9, but the term has been used loosely as "emery" per se was not available in Egypt. But, clearly, they managed somehow. 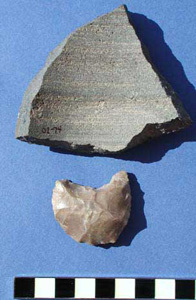 Crescent drills and stone vessel fragments from the ceremonial center at HK29A indicate that in addition to bead making, stone vessel manufacture was also taking place. 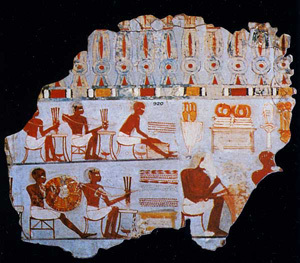 The tomb depictions of bead drilling show a bowl within easy reach of the craftsman, and this apparently contained the magic material that made it work. Stocks believes this bowl contained a runny paste which was composed of a mixture of muddy water (clay particle acting as a fine polish) and fine quartz sand, or even more likely, the waste powder from the boring out of stone vessels, where dry desert sand does work well as the abrasive and is ground fine during the process. As a result, he suggests that the two industries were interconnected and evidence from HK29A bears that out. 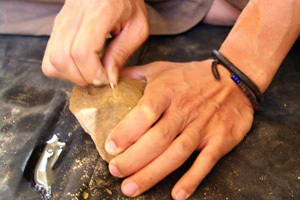 From the "temple" workshops we have recovered a variety of exotic stone materials, distinctive crescent drills and fragments of the stone vessels themselves. In the Dynastic town site too, crescent drills and bead blanks have been found together. However, this does not necessarily mean that bead maker and stone vessel maker were one and the same. Considering the time investment to make just one bead, it is hard to believe there were enough hours in the day for one person to make any progress doing both! Thus, like fine cuisine, it appears that the secret to success is in the sauce. Clearly, our bead-making kit didn't contain all of the necessary ingredients. Or perhaps it once did, but a pile of sand, even if it was special sand, is very likely to have gone unnoticed. 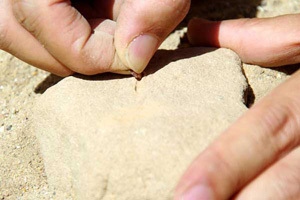 Should the opportunity to find a bead-making cache ever present itself again, we will be sure to look for it! In the coming season we will try to recreate the special sauce, and give bead drilling another try. Nevertheless, our experiment wasn't a total failure. Although we have yet to crack carnelian, it is clear that softer stones and materials could be and no doubt were bored using the microdrills. In addition, we actually learned a great deal about microdrills especially with regard to carnelian. In particular, the rate at which the drill wore down even when perforation was unsuccessful shows that the drills would need to be sharpened and replaced frequently. We'll know more once we are successful, but it looks like the average carnelian bead may have required several drills to complete the hole. Thus any self respecting bead maker would have needed to have at hand a large number of drills, and the cores and blade for making more. While the amounts found in the caches may initially have seemed rather excessive, in light of what we know now, this may not be the case. This experiment has also allowed us put in perspective the vast number of drills found at HK29A. The hundreds of drills are evidence of what must have been an active industry, but one that now seems to have been much more selective that previously imagined. Finally, we have also learned to appreciate the effort that must have gone into some of the very lovely beads we have been lucky to find and what length we can go to in order to indulge our primal urge to adorn.